No event in track and field is more difficult than the decathlon. That's because it's not one event, but 10. It's little wonder then that when Rafer Johnson, a high school star in four sports, decided to compete exclusively in track, he chose the decathlon. 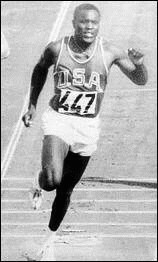 Johnson already had the world record, three national AAU championships and a silver medal in the Olympics on his resumé when he competed in the 1960 Olympics. Missing was the gold. If the finely chiseled Johnson could hold on for one more event, the 1,500 meters, he would fulfill his quest. But Johnson disliked this event intensely. "The whole decathlon is ridiculous," Johnson said, "but the 1,500 meters is insanity." Though C.K. Yang of Taiwan had beaten him in six of the first nine events, Johnson led his friend and UCLA teammate by 67 points going into the final event on the night of Sept. 6, 1960. If Johnson came within 10 seconds of Yang's time in the 1,500, the gold would be his. But it was no sure thing. Yang's personal best of 4 minutes, 36 seconds was 18.2 seconds better than Johnson's previous best. Rafer Johnson was born on Aug. 18, 1935 in Hillsboro, Texas, about 55 miles south of Dallas. When he was 1½ years old, his parents moved to an African-American section of Dallas. Johnson was raised in a ghetto-like atmosphere of segregation, discrimination and poverty. Years later, he would look back at this period in anger. "I don't care if I never see Texas again," he said. "There's nothing about it I like. If my family had stayed in Texas, I not only wouldn't have represented the United States in the Olympic Games, I wouldn't have even gone to college." In hopes of bettering their living conditions, the family moved in the mid-1940s to Kingsburg, a small town in the central part of California, about 20 miles south of Fresno in the San Joaquin Valley. Coincidentally, it was less than 25 miles from Tulare, the hometown of Robert Mathias, who would win the decathlon in the 1948 and 1952 Olympics. For a year, home was a railroad boxcar near a cannery, using a ragged curtain as a room divider, until things started improving for the Johnsons because of the help of a local businessman. At Kingsburg High School, Johnson was a superb all-around athlete, winning varsity letters in football, baseball, basketball and track. He averaged nine yards a carry as a halfback in leading the team to three league championships, scored 17 points a game in basketball and was a .400 hitter for the baseball team. But he was even better in track and field. During his junior year, Johnson was impressed after his track coach took him to Tulare to watch Mathias compete. "On the way back, it struck me that I could have beaten most of the guys in the meet," Johnson said. "That's when I decided to be a decathlon man." A month later, he won the California Junior AAU decathlon championship. As a senior, he finished third in the National AAU championships in Atlantic City, N.J. The 6-foot-3, 200-pounder was good enough to receive a football scholarship, but he decided against it and concentrated exclusively on the decathlon at UCLA. "He just got so crazy about track that he was scared he'd get hurt in football," his father Lewis said. As a UCLA freshman, competing in only his fourth decathlon, he won the Pan-American Games in Mexico City in 1955. Returning to Kingsburg, he scored a world-record 7,985 points at a welcome-home meet, breaking Mathias' mark by 98 points. In 1956, he won his first national decathlon championship. He was primed for the Olympics in Melbourne, but in preparing for the competition his knee swelled up and then he suffered a torn stomach muscle. It forced him to withdraw from the long jump, for which he also had qualified, but he gave the grueling decathlon a shot. Even if he had been healthy, though, he would have been hard-pressed to win. Teammate Milt Campbell, a 22-year-old sailor who had hoped to qualify for the U.S. team as a hurdler but finished fourth in tryouts, gave an amazing performance. He finished with 7,937 points, defeating the injured Johnson by 350 points. Johnson would never lose another decathlon. Back home at UCLA, Johnson was so popular that he was elected president of the student body as a senior. He also was the first African-American pledge to a predominantly Jewish fraternity. Between the '56 and '60 Olympics, Johnson, Vassily Kuznetsov (two-time bronze Olympic medalist) and Yang rewrote the decathlon record book. After the Soviet set a world mark with 8,016 points in May 1958, Johnson regained it later that year at 8,302 when he defeated Kuznetsov, whom the Soviets called their "Man of Steel," by 405 points in Moskva during the first U.S.-Soviet Union dual meet. An automobile accident in 1959 sidelined Johnson for more than a year with a severely injured back. In that time, Kuznetsov regained the world record with 8,357 points. When Johnson returned to the practice field at UCLA in 1960, he worked out regularly with Yang. Johnson became superbly fit, with a sharply shaped physique that triangulated from a 35-inch waist to a 46-inch chest. In July, in Eugene, Ore., both Johnson and Yang broke Kuznetsov's record, with Johnson topping out at 8,683 points. On Sept. 5, the first day of Olympic decathlon competition ended at 11 p.m. with Johnson leading Yang by 55 points though he had scored highest on only one of the five events. When Johnson hit the first hurdle badly in the next day's first event, the 110-meter hurdles, he didn't gain as many points as he had expected. But he made up for that with a personal best of 13 feet, 5½ inches in the pole vault. ... and so it came down to the 1,500 meters. Johnson's strategy was to stay close, and he dogged Yang throughout. When Yang attempted desperately to pull away in the final lap, Johnson stuck close. He finished only six yards and 1.2 seconds behind Yang, coming home in a personal best of 4:49.7. Johnson had the gold medal, setting a then-Olympic record of 8,392 points in the process. At the age of 25, Johnson had fulfilled his high school dream. "Tonight I'm going to shower and then just walk for about four hours and look at the moon," he said. "I don't know where -- just walk, walk, walk. I've got to unwind. I'm through, man, I'm through." He received the 1960 Sullivan Award for being the outstanding American amateur athlete of the year and was named the Associated Press Athlete of the Year. Johnson, whose younger brother Jimmy was a defensive back for the San Francisco 49ers from 1961 through 1976, tried Hollywood soon after returning to the United States and appeared in several motion pictures. He later became a television sportscaster before becoming involved in politics. On June 5, 1968, Johnson, who was active in the 1968 presidential campaign of Sen. Robert F. Kennedy, was walking through the kitchen in the Ambassador Hotel in Los Angeles with Kennedy when RFK was shot and killed. Johnson was a member of the President's Commission on Olympic Sports in the 1970s. He is a member of the National Track and Field and U.S. Olympic Halls of Fame. In 1984, 24 years after his gold-medal performance, Johnson again participated in the Olympics. As the final torchbearer, he climbed up the stairs at the Los Angeles Coliseum and lit the flame that symbolized the opening of the Games. The 1960 Olympic decathlon in Rome. College teammates Rafer Johnson and C.K. Yang battle for the gold medal.